When looking to buy a watch, there are many decisions you’ll have to make. You’ll need to decide which style appeals to you, which features you need to have, and what price you’re comfortable paying. Plus, you’ll need to decide which watch case material is best suited for your lifestyle and price point. Below we’ve listed out the most popular watch case materials, and we’ve identified their appearance, traits, and popularity. Every watch case material has its own pros and cons, but you’ll need to decide which material appeals to you most. Appearance: Despite the name, white gold watches can be white, pale yellow, tinted brown, or pale rose. Traits: When using 18 karat gold, 25 percent of the watch is comprised of base metals, at least one being a white metal such as silver, rhodium, or palladium. White gold is more durable and scratch-resistant than yellow gold. Popularity: Surge in popularity in the last decade since it’s a sleek alternative to traditional yellow gold watches. Appearance: Rich, warm, and traditional. Yellow gold is the standard gold option. Traits: When using 18 karat gold, 25 percent of the watch is comprised of base metals, commonly silver and copper. Typically yellow gold watches are the most hypoallergenic and require the least maintenance of all the gold colors. Popularity: Popular in high-end, luxury watches, especially vintage watches. Traits: Pure gold alloyed with copper. The more copper added, the darker the hue. Silver and zinc can also be included. Rose gold is often more durable than yellow or white gold. Popularity: Widely used in watches because it’s readily available and inexpensive. * The aluminum watch shown was given a special treatment, coating the aluminum case with ceramic. Appearance: Platinum is a natural white metal that produces silver colored watches. Traits: Incredibly hard, durable, and scratch-resistant. Platinum watches can almost always be refinished to look new again. Popularity: Even more expensive than gold, platinum watches are not common. Only high-end watch companies, like Patek Philippe and Ulysse Nardin, produce platinum watches. Appearance: Silver in appearance. 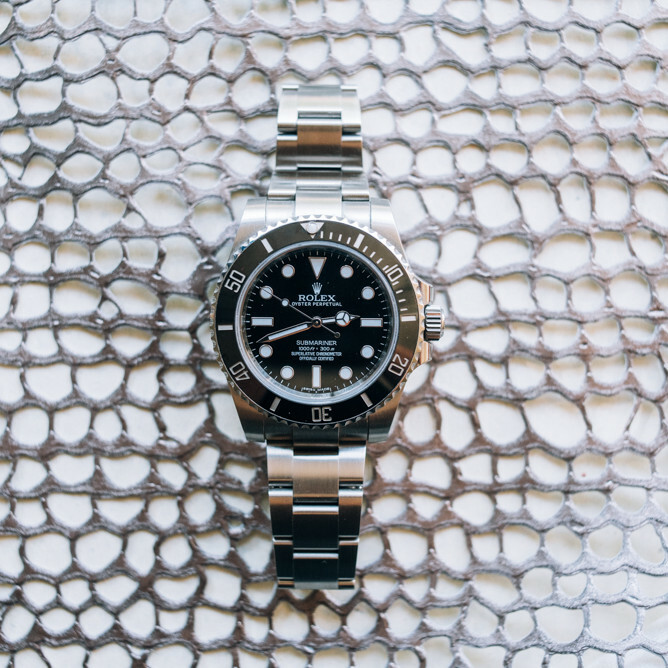 One benefit to stainless steel watches is that it can be refinished back to 90 to 95 percent of original condition. Traits: Incredibly hard, highly resistant, and requires minimal upkeep. Stainless steel does not stain, corrode, or rust when it comes in contact with water. Popularity: This is one of the most popular choices for watch consumers, especially since watches made with stainless steel generally have a longer lifespan. Appearance: A dark gray metal that gives its watches a shimmering appearance. Can be produced with a brush finishing or a high polished finishing. Popularity: Commonly used in watches and jewelry manufacturing. Great for people with allergies because it is hypo-allergenic. Appearance: Palladium is a natural white metal that produces silver colored watches. Popularity: A few companies, such as Ulysse Nardin and Moser & Co, use palladium for cases and bracelets. However, due to the high cost, it is incredibly rare to find a palladium watch. Appearance: Silver in appearance, similar to stainless steel or platinum. Traits: Naturally unreactive and resistant to decay. Unfortunately silver easily tarnishes. Popularity: True silver watches are very rare. Watchmakers will instead use silver mixed into the gold alloy to create yellow and rose gold watches. Appearance: Smooth appearance. Can be produced in a wide variety of hues and finishes. Traits: Man-made material that is highly-durable and scratch-resistant. It is also thin and lightweight. Popularity: A modern alternative to metal-based cases. Great for people with metal allergies. Appearance: Distinct appearance. Plastic and rubber watches can come in a wide variety of colors. Traits: Cost-effective, resilient, and generally waterproof. High resistance to extreme temperatures and sunlight. Popularity: Used mainly for sport and digital watches. Appearance: Goldish brown in color, but the brightness will begin to dim almost immediately and the watch will develop a unique patina or tarnish. Wearers can speed up the patina process with chemicals or they can clean the watch to bring it back to its original appearance. Traits: A softer metal that is not as durable as stainless steel or platinum. Direct scuffs or corrosion will take their toll on bronze watches. Popularity: Not common and oftentimes expensive. Some buyers find the patina that comes with bronze watches attractive while other buyers do not. Description: Process in which a layer of material is bonded to the base metal. Traits: Increases durability, reduces friction on metal components, improves hardness and wear resistance. Description: Process in which the diamond-like carbon is bonded to the base metal. Traits: Similar to a diamond, this coating is incredibly hard. It is also scratch- and dent- resistant.